Letterfrack Lodge is situated 80 metres of the N59 in Letterfrack village, Connemara. 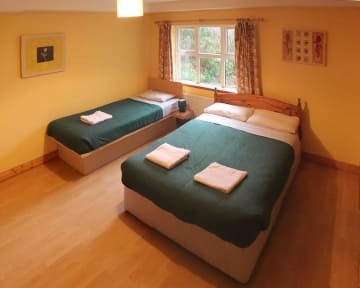 The hostel is a 2 minute walk to the Connemara national park entrance. We offer a high standard of hostel accommodation with 11 ensuite rooms. All rooms have timber floors and tiled bathrooms. There is one large well equipped kitchen, a dining areas and a lounge area. We also have a cosy traditional style bar. laundry for guests. Breakfast is available. We can cater for large groups up to 56 people. The Hostel is new, clean and well run. There are free maps available showing walks in the area for all grades of walkers. Michael, the owner, has a vast knowledge of the area and will point you in the right direction.